Sinsaenum is an interesting prospect for a supergroup. Headed up by guitarist Frédéric Leclercq of DragonForce fame and Joey Jordison (currently of Vimic, formerly of Murderdolls and Slipknot), the pair are given a platform to explore their more extreme tastes in metal with the assistance of Sean Zatorsky (Dååth), Stéphane Buriez (Loudblast), Attila Csihar (Mayhem) and Heimoth (Seth), who each add to the band with their extensive experiences in extreme music. While their 2016 debut album Echoes of the Tortured was well received for its neatly executed blackened death metal, it suffered from below par production and at times a “beginner’s guide to death metal” feel to the songs. Nonetheless, this band wasn’t to be a one-shot deal and they returned with last year’s Ashes EP, with a crisper production and improved songwriting. Unfortunately, Attila couldn’t contribute to their next effort due to other commitments (aside from a songwriting credit on closing track “Forsaken”), so the remaining 5 took it upon themselves to work on their sophomore album without him. Thus, now we are presented with Repulsion for Humanity. Going for the jugular from the outset, it’s clear that Repulsion for Humanity is leaning further on its death metal influences than black metal this time around, possibly due to Attila’s absence. The jackhammer drums of Jordison, with Buriez and Leclercq’s breakneck riffs, ensure the opening title track immediately catches the attention of listeners. There already seems to be more cohesion and technique this time around than on Echoes of the Tortured, with the intensity taking time out for plodding mid-tempo breaks and pace changes that weren’t as prominent before. Speaking of mid-tempo, the assault of the opening track quickly gives way to “Final Resolve”, with its slower, groovier riffs showing another side to Sinsaenum’s music but at the same time being no less effective in its sheer brutality. It does call into questioning the track order somewhat, with the decision to open with a fast track before following with 3 more groove based tracks (“Final Resolve”, “Sworn to Hell” and “I Stand Alone”) messing with the pacing of the album. Things kick back into gear with “Rise of the Lightbearer”, utilising haunting keyboards to add an extra dimension to the music. The added groove of some tracks such as “Sacred Martyr” (featuring Once Human’s Lauren Hart) is a nice touch, creating an access point to more casual listeners who may be turned off by the aural onslaught of the faster songs, while the aforementioned fast songs provide something for more seasoned death metal fans to sink their teeth into. It’s clear that Sinsaenum have made this a much more collaborative effort this time around in order to expand their sound into new territories and ensure that there is something for all fans of extreme music to enjoy on here. Sean Zatorsky takes centre stage well on the vocal front while Attila is absent, and the use of guest musicians such as Lauren Hart is effective in filling that void. As mentioned earlier, possibly the biggest weakness in Repulsion for Humanity lies in its pacing. The tracks don’t feel like they gel well enough together to work in a traditional album format where you listen to it all in one go, rather, there are different moods to them which make them much more effective individually or in playlists. The two longer tracks, “Manifestation of Ignorance” and “My Swan Song”, for example, feel most out of place in the middle of the album, whereas 9 minute closer “Forsaken”, with its more melodic approach, is well placed to finish proceedings. It may also come as a disappointment to some that Attila is completely absent from the album (aside from some lyrics on “Forsaken”), and his absence is noticeable at times, particularly with regards to the overall sound of the album. Whereas Echoes of the Tortured catered to both Sean and Attila’s vocal styles to create something closer to blackened death metal, the songwriting here is much more in line with Sean, thus making it a much more standard death metal affair. Even though the album works well within the confines of the genre, it would have been nice to have those odd flairs of black metal which Attila could have contributed to. Nevertheless, Sinsaenum have proven one thing: they are here to stay. With a tour coming up towards the end of the year, things are picking up nicely for the boys (which is more than could be said for Jordison’s Vimic project) and some of the songs on Repulsion for Humanity feel like they belong in a live setting. As the members further begin to understand each other’s songwriting approaches, the music will continue to improve and with this effort they are well on the right track. 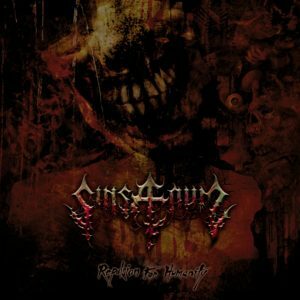 Sinsaenum’s new album Repulsion for Humanity is out now via earMUSIC/Peccatum. Visit the band on Facebook.